Armed conflict may appear to be in long term decline, but the intractability and destructiveness of contemporary conflicts make conflict resolution as urgent and necessary as ever. 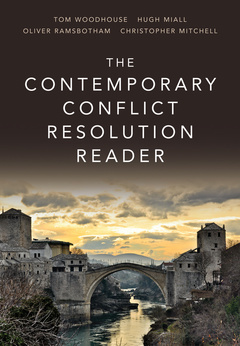 , The Contemporary Conflict Resolution Reader is the first comprehensive survey of the field as it has evolved over the last fifty years, bringing together the seminal writings of its founders with the cutting–edge interventions of today’,s leading exponents and practitioners. Drawing on their extensive experience and knowledge of conflict and peace research across the world, the editors have selected a rich and illuminating set of readings that offer a unique and accessible overview of the many different aspects of conflict resolution. ,The chapters range across prevention, nonviolence, constructive approaches, mediation, negotiation, reconciliation and peace–building. Each one is framed by an editorial introduction and the readings are helpfully broken up into the following sections: reflective pieces, guides to practice, case studies and tools for learning. , , Covering classical and contemporary ideas, the Reader includes extracts which mark the continued innovation, relevance and dynamism of the field globally. ,Whether used on its own or as a companion to the hugely popular Contemporary Conflict Resolution , this Reader will be an invaluable resource for students and teachers of peace and conflict research, politics and international relations, as well as practitioners working in the field. ,While acknowledging the scale of the challenges ahead, this inspiring collection suggests a hopeful and practical vision of the way forward for conflict resolution in the 21st century.